Thank you for being a guest host on The Recovery Show. Here is what to expect, if this is your first time as a guest host. And if you’ve done it before, here are some reminders of what will happen and what we expect from you. Please arrive on time. It usually takes about 2 hours to fully record one episode. What happens? In brief, we will talk about the topic of the week. Spencer will guide the conversation, based on a set of discussion points that we will send you ahead of the show. You are encouraged to think about the topic and the discussion points before time. If you want to bring some notes, please do. Be aware that we want to have a conversation, so please do not write out full answers and then read them, because that ends up sounding artificial. After our topic discussion, we will take a brief break, and then go into the “our lives in recovery” segment of the show. The goal of this segment is to give our listeners a view of what it is like to live life in recovery. We talk about what we learned or were inspired by in our meetings, and how we use the program in our daily lives. In this segment, we are careful to preserve the anonymity of other members of the program. (Example? “We discussed Step 6, and I heard this great analogy…” keeps it to my experience and does not potentially expose any other person.) We end by reading emails and other feedback from our listeners, and also some brief announcements about the podcast and the website. You will be asked to read from the script. Our “studio” is in a spare bedroom at Spencer’s house. 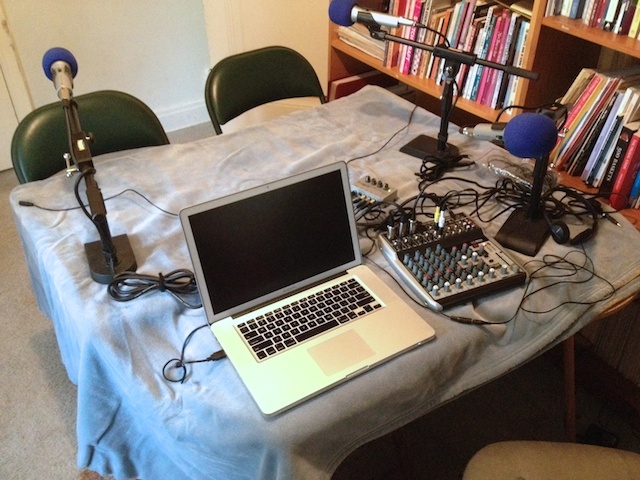 When you enter, you will find microphones set up around a table. We will start by talking over the points in this guide, and by having each of us practice speaking into our microphone, so that we can get recording levels properly set. When we are all comfortable, we will start recording. If you say something you don’t want included, or if you want to start over on something you said, we can easily fix it in “post production” when we edit the show. The recording studio needs to be as quiet as possible, so remove “jangly” jewelry, etc. and turn your phone to silent (or turn it off). You are encouraged to bring your favorite earbuds or headphones, so that you can listen to the audio as it is being recorded. We have “loaners” if you don’t bring yours. Bring notes if you wish. Bring literature if you think you will want to refer to it. We usually have copies of the main Al-Anon books with us (How it Works, Courage to Change, Paths to Recovery). If you wish, you can use an alias during the recording. We will do our best to remember to use it, and we will edit out any goofs. If you say something you wish you hadn’t, you can mention it at that moment, or tell us afterward. We usually edit the show the same day it is recorded. Requests for editing that come in later can be accommodated, but we can’t “call back” any copies of the episode that have already been downloaded by listeners. If you get tongue-tied (it happens to all of us), pause, leave a few seconds of silence, then start over. We will edit out the first try and keep the second. Most of all, relax. It really is a conversation, just with microphones. Many of the same guidelines apply if you are participating by phone, Skype, or Apple Facetime. Skype or Facetime on your smartphone will give the best audio quality. If you have a headset or earbuds with built-in microphone, you can use it. We will generally get decent sound quality that way, and you won’t get tired/sore from holding the phone to your ear for over an hour. If you are using Skype or Facetime on your computer, the use of earbuds or headphones will make it so Skype/Facetime doesn’t have to try to filter out the sound coming from your computer speakers, and will make it easier to understand you. In any case, using a “speaker phone” setting is not recommended. Find a quiet space for the call. Background noises will come through into the recording. (If you can hear it, so can the microphone!) I can remove some background noise, especially if you are not talking when it happens, but it's best to minimize it. I usually record on Sunday afternoons, but can adjust to your availability. I am in the Eastern time zone of the US, which is GMT-5 for standard time (November-March), GMT-4 during the summer (Late March-Early November). Recording a complete show usually takes about 2 hours. I will send you a copy of the “script” before we sit down to record. If you have a Google account, I can share it directly as a “Google Doc”.